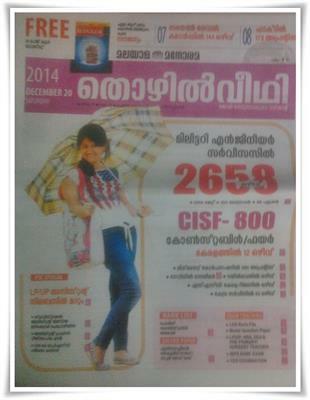 Thozilveedhi, being a popular employment newspaper is widely read by job seekers in Kerala. The 20th December 2014 issue of Thozhilveedhi is thickly packed with new job prospects in both government and private sectors. The latest edition of Thozhilveedhi is comes with jobs in various sectors including Military Engineering Service, CISF, Lignite Corporation, Navy, Railway, Central Service, HOCL, VFPCK, KUFOS, IISER, South Naval Command and East Central Railway. Fresh appointments in NIT, Rubber Market and Agriculture University are also reported. While going through the pages, readers can find latest job opening like 22 Assistant Managers in VFPCK, 144 Southern Naval Command,173 Apprentices in FACT, 800 constables in CISF, 56 in East Central Railway, 2658 in Military Engineering Service, 390 Apprentices in Naiveli Lignite Corporation, Sailor in Navy, Railway and 63 in Central Service. Vacancies in HOCL, Assistant Professor in KUFOS and Field Manager in Agricultural Department would give more opportunities for freshers. LGS rank file prepared by Lakhsya Academy, IBPS PO exam orientation by TIME, LP/HSA,DEd & Pre Primary Nursery Teacher exam direction provided by Florence Academy would guide the candidates who are currently undergoing final preparations. In the PSC special section, news about syllabus change in LP/UP Assistant and notification regarding Assistant professor is given with prominence. 2015 UPSE exam calendar will be more helpful for the job aspirants. Solved papers of Peon/Watchman/Security Guard/Watcher Grade II,exam coaching titled LGS Rank File, model question paper, LP/UP,HSA, DEd & Pre Primary/Nursery Teacher, IBPS Bank Teacher and CDS Examination are also published in this issue. The PSC rank list of Police Constable Driver has also been published in the recent edition of Thozhilveedhi. Regular columns including Open Forum, PSC for Beginners, Syllabus of various upcoming Kerala PSC exams and Hall Ticket details are much beneficial for the PSC aspirants. Questions asked by the readers are answered by PSC officers. The free booklet 'Competitive Winner' in capsule format is much enlightening.